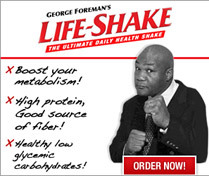 Summary: George Foreman's Life-Shake is designed to provide your body the complete nutrition it needs in just one easy delicious shake a day. George Foreman's Life-Shake is designed to provide your body the complete nutrition it needs in just one easy delicious shake a day. Loaded with essential vitamins, minerals, proteins, enzymes, and antioxidants. You will feel increased energy levels, and keep yourself satisfied until your next meal. Available in Vanilla, Chocolate and Berry Blast flavors, it provides over 100 vital nutrients in just one serving!